Can't figure out what to get someone for a Holiday gift? In the spirit of this economy, how about sending them a pony? 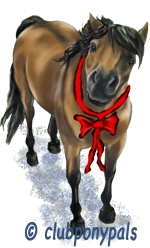 Club Pony Pals' Christmas Pony Program now offers a novel way to give lucky friends their very own, lifelike online pony. To get a free pony, go click on the image above, or email this link http://phplist.clubponypals.com/wigweekly/Christmas_pony.php to anyone who wants a free virtual pony. There is also a printable gift certificate to give as a tangible gift. “This is the pony any parent can afford,” notes the CEO of Clubponypals. Recognized worldwide as the home of the web's most lifelike virtual ponies, Club Pony Pals is the only English language, COPPA compliant horse game that people of any age, everywhere can also play directly from Facebook. In keeping with Club Pony Pals' vigilant focus on the safety of their membership's personally identifiable information (PII), their coders have programmed a unique one-way route that takes Facebook members to a secure site that includes point of view riding, games and COPPA compliant, fully moderated social network. PII for under-13 Club Pony Pals members' is not accessible directly from Facebook. Clubponypals.com is a COPPA compliant pony-themed social game that features a fully moderated “Facebook”-style experience for under 13 members from around the world. It enables and encourages limited connection between site members while filtering out PII. "Really, it is a great way for young people to learn how to manage their social identity in a protected setting." "Our site features many thousands of user generated art images, user-generated game items, member-to-member gifting, moderated text messaging, moderated live chat sessions, multiplayer areas with pre selected "canned" chat choices, moderated roleplay, topically themed clubs, original story contests, a newsletter about members' accomplishments, math contests and more." "We have spared no effort in creating our site as a virtual gathering place for young people in over 150 countries who are too young to play on Facebook. On our site, they can safely communicate about their shared interest in all things pony-related, in a safe, protected setting." As European sociological studies have found, worldwide, as many as half of all girls and women want ponies or horses, yet most are not able to have them for practical and financial reasons. "Our free to play, freemium site has become an all-ages destination for anyone who loves ponies to play and meet others who do too. While 95% of our members are female, our age range includes under 13's, teens and adults. All are welcome because our full moderation restricts what information can be displayed." As time passes and we all get older, I am more thankful than ever for each day. Please enjoy your Holiday and write in about your outlaws.